Founded in 2001 by Director Gabriele Boccaccini, the Enoch Seminar is an open and inclusive forum of international specialists in early Judaism, Christianity and Islam. Scholars with different methodologies and approaches and at various stages of their academic careers, from graduate students to senior scholars, meet and share the results of their research. In this global world of 21st century academia, the Seminar is committed to fostering diversity in all its forms and promoting dialogue and mutual understanding between Jews, Christians, and Muslims about their common roots. The Seminar supports an online encyclopedia of second Temple Judaism and Christian and Islamic Origins. The encyclopedia is constantly being updated, and contains a huge array of entries on such topics as Second Temple, Enochic, Apocalyptic, Qumran, Apocrypha, Wisdom, Pseudepigrapha, Johanine, Petrine, Pauline, and Gospel Studies. The primary mission of the Seminar is to foster scholarship on the ancient Mediterranean world that transcends conventional, and often isolated, disciplinary and methodological boundaries. It encourages discussion among specialists in the Hebrew Bible, Second Temple Judaism, New Testament, Late Antique Judaism and Christianity, and Early Islam through international meetings such as the Enoch Seminars, the Graduate Enoch Seminars, the Nangeroni Meetings, the Enoch Colloquia. These meetings have distinctive formats where papers circulate in advance, are thoroughly discussed among participants, and are subsequently disseminated to a wider audience via publication. Enoch Seminar Online, edited by Jason von Ehrenkrook in collaboration with Kelley Coblentz Bautch, functions as a crucial repository for this rich conversation among scholars. The site features papers from international meetings, book reviews covering some of the most important publications in the field, announcements of upcoming events and conferences, and relevant information about the study of early Judaism, Christianity and Islam. 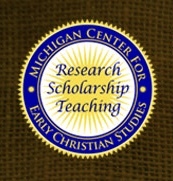 The Enoch Seminar is supported by the Michigan Center for Early Christian Studies, the Alessandro Nangeroni International Endowment, and the generous contribution of friends and members. Access to the website is free, but due to copyright issues, some conference papers are restricted to members. Please REGISTER if you like to receive information on the activities of the Enoch Seminar. For more information, contact the Enoch Seminar Secretary Jason Zurawski at j.m.zurawski@rug.nl.